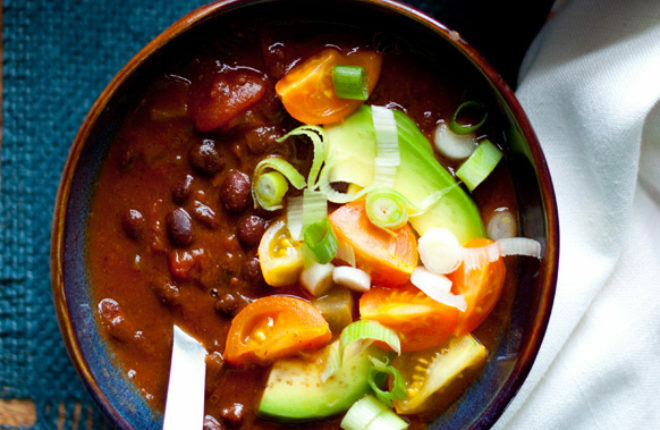 Black beans, pumpkin, chili spices, and pumpkin spices simmer together in your Crock Pot to make a perfect – and perfectly healthy – fall meal. Then I tried it. Not half bad, I thought. Still a little weird, but also sort of perfect too. Perfect weird. A harbinger of fall, pumpkin, along with pretty much the best spicy, hearty dish to serve on a cold, frosty October evening? Not such a crazy idea, maybe. So I worked on it. I tweaked and poked and made countless versions of pumpkin chili, all the while really coming around to this stuff. It’s so, so perfectly delicious. 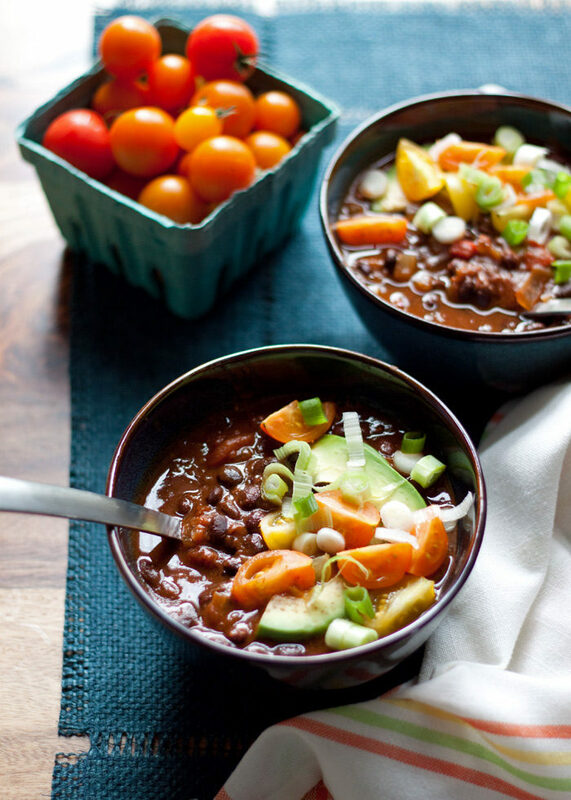 I mean, the fact is, pumpkin and pumpkin spices – cinnamon and cloves – really do work in chili. 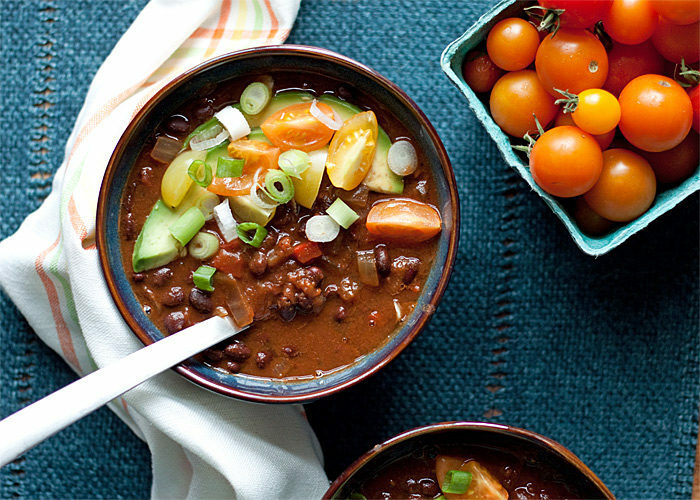 Especially black bean chili. It all makes what’s already a cozy dish even cozier. And I love the body that the pureed pumpkin adds. Plus, with all the extra vitamin A the pumpkin brings to the table, it also makes a healthy dish even healthier. Sometimes the things that seem the weirdest are the very same things that end up just belonging together. Peanut butter and dill pickle sandwiches are another good example. No? Well, think on it. We might just talk about those someday too. A note on heat: This pumpkin chili, as written, is very mild. If you prefer a spicier chili, you may consider doubling the chili powder, adding some cayenne, or chopping up a spicy pepper and adding it to the mix. Yay! So glad you liked it. And your blog name is adorable. I’ve been trying to find a better black bean pumpkin chili recipe, since the last one I made up left something to be desired. Do you drain the tomatoes? My last chili was too watery and I don’t want that to happen again! Did you add veggie broth or anything to yours! It looks so pleasantly soupy in the picture, and I’m thinking mine will be more like a chunky stew. That said, mine is in the crock pot right now and I’m excited! I added butternut squash, garlic, paprika, and cayenne to mix it up a bit. Thanks for the recipe! Did you add veggie broth or anything to yours? It looks so pleasantly soupy in the picture, and I’m thinking mine will be more like a chunky stew. Hi Lauren, nope! I use the recipe exactly as written. Crock Pots don’t really allow for evaporation so even when things seem super thick going in, usually it’s nice and soupy by the end. Your alterations sound terrific – hope you loved it! 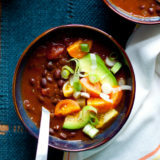 Pingback: Just A Few Vegetarian and Vegan Crockpot Recipes for the Cold Months Ahead! Hi, this recipe looks delicious. Do you know if each serving is 1 cup? Have made this twice and it’s amazing! And I hate vegetables! It has such an amazing flavour. We topped it with cheddar and it was YUMMERS! Have made this many times since you first posted it but wanted to pop in and say how AMAZING it is! 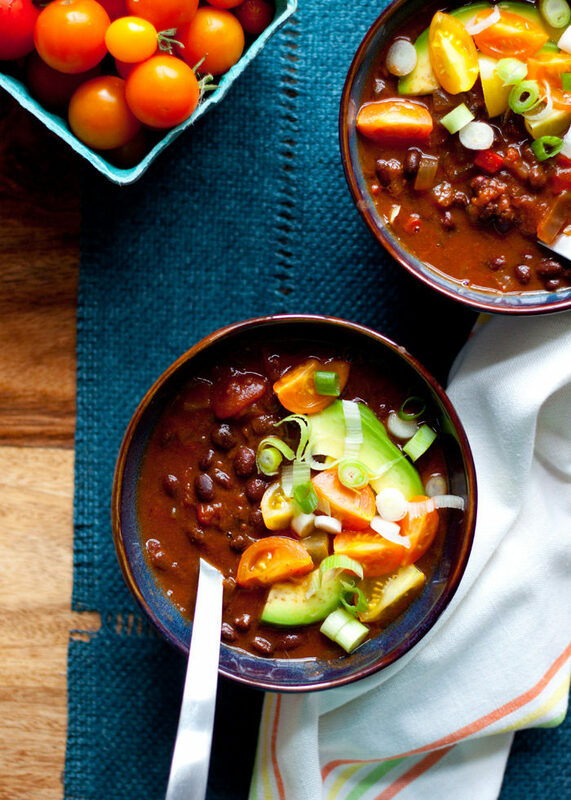 When I stopped eating meat five years ago, I thought I was going to have to give up chili because I didn’t like the vegetarian type but there’s just something about the combination of flavours in this! I would eat this five nights a week and have shared the recipe with MANY people who all loved it! And bonus! It couldn’t be simpler to make! Thank you very much for sharing it! I omitted one can of black beans and used a can of chick peas. I added a little more salt and a little broth. Along with that I included carrots and corn. Delicious! Hi— this looks amazing! My two fav ingredients combined, which will be perfect on this blustery fall day. Since I am late to the game, I am wondering if I can make this on my stove top and simmer for a few hours? So good! I missed my slow cooker so much when I was abroad. You might want to add a little extra salt if you cook your own black beans but I think the salt level is fine on the chili on the third day, hehe. And it does get better as a leftover. This is really nice because there’s barely any prep and a very long cook time for those of us who have busy schedules.